If you are looking into purchasing a paintball good for a tournament or just for the sake of fun, one of the first things that you will notice is that they are extremely expensive. While you are scrolling through the list of different makes and models, I am sure you have found yourself asking the same question over and over to yourself, “Why is this little paintball gun so costly?” Well, let your mind be at rest, we are about to give you the answers to your racing thoughts. If you are looking into purchasing a paintball gun just for the fun of having a thrill every now and then. It is important to remember that this object you are investing in, is actually a part of a professional worldwide sport. When you are buying something that has a bigger purpose than just to have a good time, you have to expect that you are going to pay a little bit more to be able to enjoy this object. There is no secret that these machines are not made from cheap plastic. These are crafted out of a various amount of items, but the main body of the machine is created out of metal. This means that the paintball gun is going to last a very long time. For e.g Tippmann Cronus is considered one of the most durable gun. Even if you leave this gun at a place for 10 years and you return back and use it, it would work just fine. Also, this is not very simple to ensure the right material for different versions of paintball markers. For e.g, some of them have a high recoil and other have less recoil so for high recoil engineers ensure that they put more weight in the barrel so that the gun doesn’t move while you take the shot. With that, they also need to keep upper limit of the weight they can add to the gun so that it doesn’t feel heavy while you run holding your gun. Paintball markers from Brands like Tippmann, Empire BT also withstand drops, scratches, high falls, impact and many more collisions that could damage a different type of material. So, in the long run, you would actually be saving money by coughing up a little bit more for a metal gun, rather than scavenging the internet looking for one made from cheaper materials. You might be paying a more upfront cost for the better product, but anyone who has ever indulged in the game of paintball knows it is a rough sport and you as well as your equipment can get damaged. The last thing you would want is to have to buy a new gun after every round, this is why the craftsmanship adds to the price. Another key aspect in the production of this product is the time and skills required to manufacture these items. 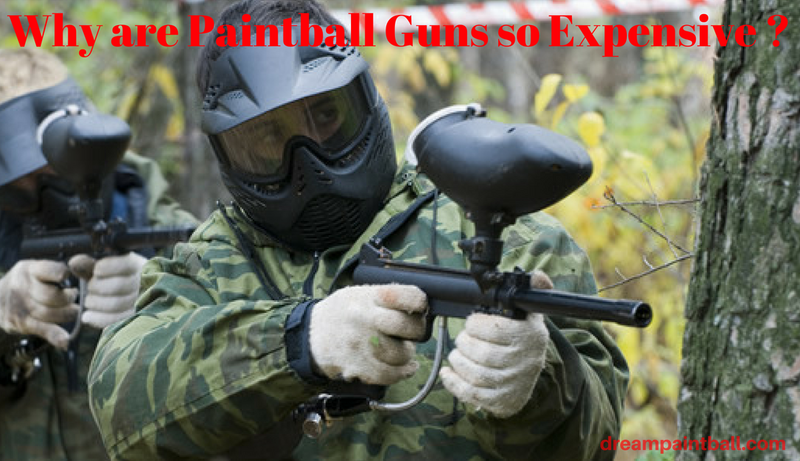 Paintball guns come in many different sizes and shapes, the inner makings of these products also are very high tech. It takes a lot of many power to come together to create the perfect machine that is going to perform well and maintain a high quality not only in the beginning but throughout the lifetime of the product. It is also a constant competition for themselves as a company to constantly produce a better gun than the previous version that is released. This takes time and time is money. The more people who are involved in the production, the more money the item costs. Another reason that paintball guns are so costly is that of the electronic and extra features that are added to these objects. It is not just a piece of metal that fires spheres of paint at a board or opponent. They are constructed to be the best of the best on the playing field. Few come equipped with lasers to allow the shooter to know exactly where his shot is going to be fired and allows them to make a good judgment based on range and angle. There are double barrel options, this allows the gamer to shoot more than one paintball at a time at their desired location, giving them the ultimate gaming experience. They come with scopes, which allows the player the option to see better in long range situations, if you are face to face with just you and one other person and you find yourself hiding in a tree, one missed shot will give away your location. You want to know where you are firing and how much distance is standing between you and victory. They are loaded with automatic fire, this feature allows the player to shoot freely at multiple opponents or boards at the same time without having to use too much focus on pulling the trigger. Some models are also available with a backup power source to keep the player on the field as long as possible. This is the last step before packaging, and one of the most important steps in the production of the paintball guns. Paintball brands like Tippmann, Empire BT, Spyder are well known all over the world for the best paintball equipment. They ensure that they test each gun before packaging which takes a lot of time and energy. It makes the product even more costly but the excellence really shows in their work. These brands are pretty dedicated to providing the best experience to their customers. When it comes to buying your next paintball gun, do not let the high price deter you away from one of the greatest experiences you will ever have by shooting off one of these machines. They are fun, fast and extremely addicting. You will be purchasing with confidence, knowing that you have invested in a high-quality machine that is going to keep up with you round after round. Previous Article Can a Paintball Gun Kill a Bird, Rabbit, Cat or Squirrel?